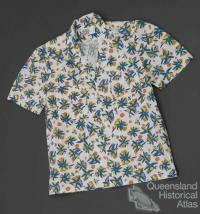 Clothing worn in Queensland has been, and remains rich with inconsistencies. Since European settlement, it has ranged from colonial men in tropical whites and pith helmets, bourgeois women in uncomfortable bustles, to the tough work gear of outback station dwellers or Chinese laborers distinctive in straw hats with loose tunics and trousers. More recently one can point to those notorious property developers ‘the white shoe brigade’; the gaudy leisurewear and glittery accessories of the well-heeled at Surfers Paradise; stockowners with broad felt hats at the Ekka; Steve Irwin’s signature khaki - or even the city suits treated with suspicion west of Toowoomba. Attire has been as much Cloudland ball gowns and schoolgirls in hats and gloves, as flashy 1960s Gold Coast meter maids in gold lamé bikinis. What we can say though, is that until globalisation, Brisbane dress has been more conservative than Melbourne or Sydney. Everywhere, climate, occupation, demography and life habits have all inflected clothing, while class, gender, age as well as race add to its complexities. But even in the twenty-first century, the weather of the Sunshine State continues to affect choice. ‘Often nothing may be worn’! Queensland rainforest Aborigines when first noticed by Europeans were mostly naked apart from accessories (headbands and grass reed necklaces) but dressed up for ceremonial occasions. Many items used were unique to their environment, such as bark blankets, crescent-shaped baskets, and heavy, single-handed swords with decorated kidney-shaped shields. Contact with Europeans, who issued them with coarse blankets or gave them cast-off garments, gradually inflicted change on age-old practices. Indigenous people made use of Western goods in imaginative ways such as unpicking blue and yellow threads on government blankets to weave into their bags or baskets. Today, little that is unique in everyday Indigenous dress remains. A misunderstood stereotype is that Queensland settlers replicated European attire, mindlessly ignoring the sweltering heat. But a surprising amount of clothing for both sexes suited the climate. In private, women loosened their stays, and chose light bodices and outfits of summery cretonnes and ‘zephyrs’, widely advertised in the Brisbane Courier. Outdoors they wore wide brimmed hats or boaters, occasionally frilled bonnets, and carried sun parasols. 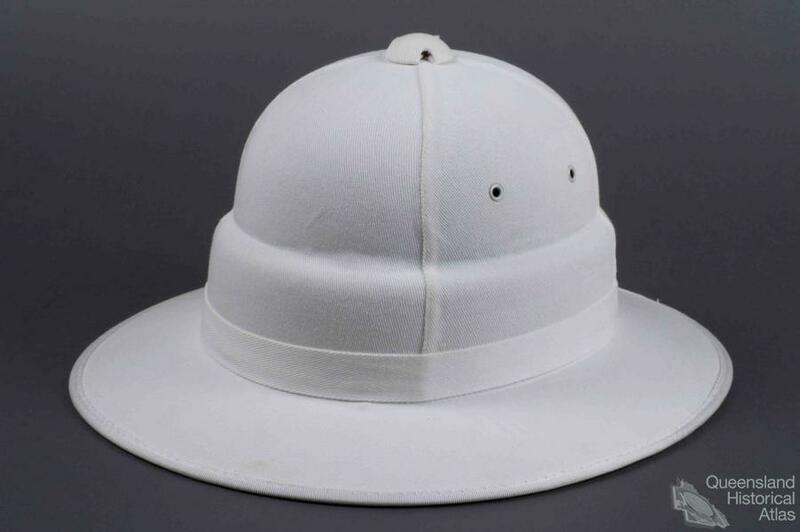 Professional men and merchants often wore lightweight, white tropical gear with broad-brimmed straw and felt hats or pith helmets, influenced by European clothing in India. 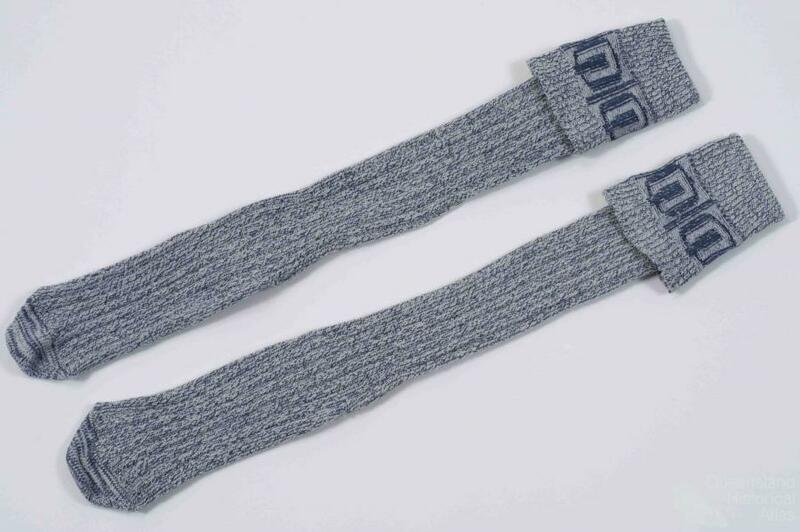 This lasted longest in the State’s north, although special ‘sensible’ lightweight clothing continued to be sold into the twentieth century. In 1887 Ipswich Woollen Mills and factory advertised its products as especially designed for the climate. By the 1890s, as urban populations became more concentrated, most professional men took to dark readymade suits. These were chiefly locally made, although today clothing and footwear manufacturing has mostly shifted offshore with garments sourced primarily from China. At this time, men’s sporting dress became differentiated according to game or activity. Bourgeois women flirted with so-called rational dress, cycling outfits and ‘tailor-mades’, keeping out of the sun where possible to preserve the whiteness of their skins. Some in Brisbane still wore ankle length dresses for swimming even in the 1920s. ‘Too Good for the Bush’? In the nineteenth century, European women resident in principal towns might patronise dressmakers, acquire clothes from department stores or make their own. The small social elite everywhere, including pastoral properties, observed proprieties. Particularly for formal occasions they endeavored to keep in touch with the latest, if sometimes inappropriate, styles worn back ‘home’. Protocol decreed ‘ladies’ minimise similarity to those Australian-born with supposedly ‘rough’ manners and careless attire. But trying to keep up appearances, anxiously making replacement crinolines or altering garments in rural areas (based on knowledge gleaned from ‘home’) you could be months behind the latest styles. Working-class women active in stock control, farmyard duties or timber-getters wore practical, looser clothing. For men, both in urban and rural areas, dress was a particular sign of their occupations. Unlike business people and merchants in town, surveyors, gold diggers, miners, pastoralists and stockmen wore tough working clothes. These often failed to betray the finesse of class, being little different from clothes of indentured Pacific Islanders or indigenous cattlemen. Queensland, for years a tourist destination, has played on images of golden sun tanned bodies and colourful swimwear, though after the rationing of World War II urban clothes for both sexes remained conservative. And in the 1950s you could still see older men wearing neck to knee swimming costumes that they had bought in the 1930s. Certainly, following the mid-twentieth century youth revolution, Brisbane had its share of dressed up Bodgies, Goth, Punk and other subcultures but the truth is it has never been a serious centre of high-end fashion like Melbourne, lacking the rag trade of that city’s Flinders Lane. Essentially it is for beach, surf wear and the cover-up Stinger Suit (protecting against venomous jellyfish) that the State is best known. Paula Stafford’s business, located at Surfers Paradise, is credited as the first manufacturer of bikinis in Australia, the designer legendary for her commercial acumen and saucy leisurewear from the early 1950s. Most renowned though is Billabong surf wear founded at Burleigh Heads in the early 1970s and now a vast global brand. 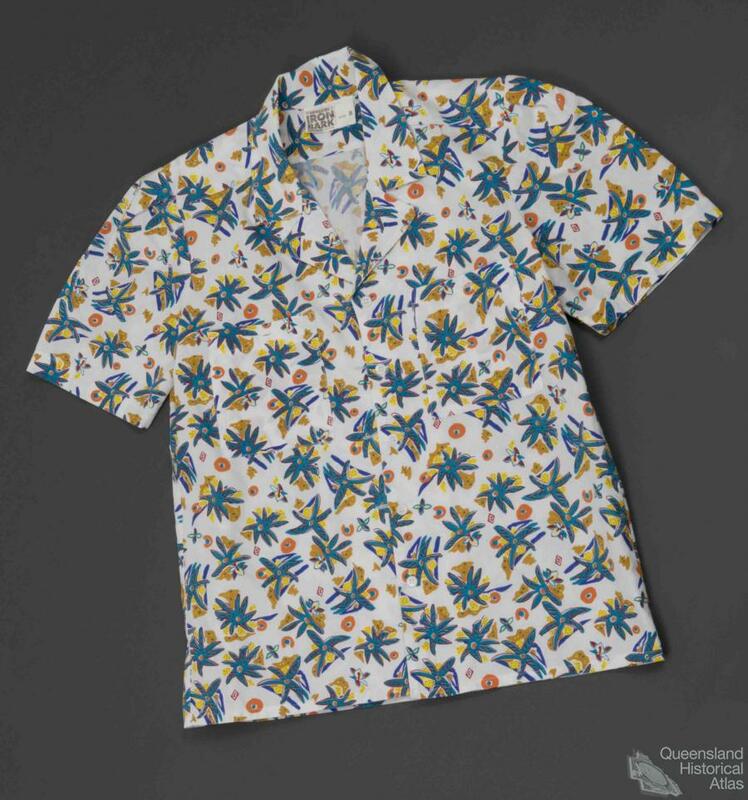 Queensland designers Easton Pearson, with a partnership base in Brisbane from 1989, also have a worldwide clientele in the twenty-first century. Eclectic and imaginative, fusing motifs from diverse cultures, they are the closest thing to international fashion Queensland has yet produced.